Good hair day doesn’t happen by chance. It happens by a great mind of the beholder and absolutely accompanied by good stuffs. What a good hair day means to you? We believe that what is inside counts the most. It is always true because our feeling normally influences how we look and so does it affects our self-esteem. But we also believe that an appealing appearance of the hair, good scalp health and its hygiene positively impact our lives. So here our definition of good hair day. A complete good hair care routine for a confidence and self-esteem. 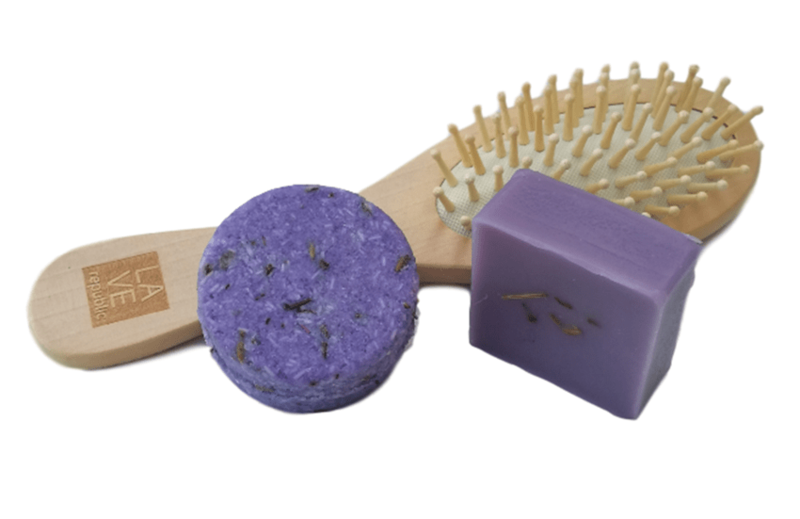 1pc of Shampoo Bar, 1pc of Conditioner Bar, 1pc of hair comb or brush of your selection. Approx. weight: Shampoo Bar (65g), Conditioner Bar (50g), Comb / Brush (25 – 65g depending on variant). Sandal Wood Comb (wide-toothed) recommended for thick, medium to long hair and sensitive scalp. Nanmu Wood Comb (fine-toothed) recommended for thin and short to medium long hair. Birch Wood Bristle Hair Brush recommended for all hair types and length and sensitive scalp. Know your hair types and scalp conditions. A condition of the scalp that causes flakes of skin to appear. It is often accompanied by itching. Dandruff caused by an overgrowth of a harmless yeast resulting skin cells to shed more frequently and clump into flakes. A condition when sebaceous glands in scalp produce excessive sebum, which travels down the hair shaft resulting oily scalp and greasy hair and always lead to dandruff. A condition when the scalp has too little moisture. It becomes irritated, flakes off and frizzy hair. Weak hair follicles, caused by a variety of factors including dehydration, poor nourishment, heat damage, etc, produce thin and lack-luster hair that eventually falls off as the follicles go into a dormant phase or telogen hair cycle. A condition frequently caused by dandruff, oily or dry scalp. softer, smoother and shinier hair with healthy scalp and hair follicles.